Porsche has had a history of grand championships, high performances, quality design and luxury status. If you want to make heads turn, get yourself a Porsche, not only are they fast but they can also come with a expensive price tag. There is nothing like nice wide open roads in the country and driving a beautiful Porsche as your ride. If you have a spare couple of million to spend as pocket money, then picking up a rare Porsche is like going out for a coffee. But if you can only dream, here are the top four most expensive Porsche ever. 4. 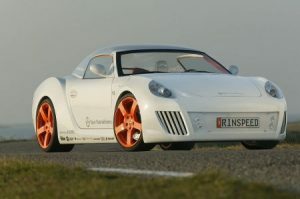 One of the lightest cars made for its class, 2006 Porsche Rinspeed ZAZEN. Porsche worked with Bayer Material Science Technology to create a concept car using lightweight plastic materials to enhance the acceleration. The engine is the same that is used to powered a Carrera S. The cars were sold for $2 million. 3. For $2.3 million, Porsche 911 Carrera RSR 3.0 was built in 1974 and in recent times was previously owned by celebrity comedian Jerry Seinfeld. This bright yellow Porsche became a style and sports design icon. The design of the wide spoiler and rear wings started a trend, still until this day the design is timeless. 2. An original 1959 Porsche 718 RSK went to a home for $2.86 million, it is one of the first race cars built by Porsche, silver curves and wonderfully design the shape is interesting resembles a shake its pointed front and gills. 1. Perhaps for breakfast something out of the cereal box, the Porsche 917 Can-Am Spyder bold and covered in racing stickers, was sold a couple years ago for $3 million, it’s a very ingenious design as this 917 was created to compete in the North American Can-Am races. The design and engineering was heavily appreciated for its endurance, it has a 54 L V12 turbocharged engine.